Surely Andy will have more support from adults when a creepy doll starts hunting him down again? A young boy called Andy has a fear of dolls, and is forced to live with a strict foster family; Chucky, a living, talking and murdering doll, hunts him down in order gain his human form back by taking over the boy’s soul. Child’s Play 2 suitably skips the introductions of the consistent characters in Andy and Chucky, which helps quicken pace and allows for more character development around Andy’s new family and his older foster sister, Kyle. Unfortunately though most of the family come across as incredibly frustrating for the viewer, with them deciding to put any abnormal occurrences down to his troubled past rather than actually listening to his cries for help. Despite this, it does work well to isolate the young boy in the end, ramping up the scare factor for the later scenes. Andy is also now played more comfortably by Alex Vincent, who himself is two years older, moving past the annoying child of the first film; gone is the uncontrollable whining from the previous film, and he seems to have a more significant lasting contribution to the film – again, this is likely down to his slightly older age and Don Mancini’s written development of the character. This thrilling sequel excels mainly in its horror elements and relies heavily on its ability to scare, also taking up a more interesting and, dare I say, realistic outlook on the living doll. His relentless pursuit of the boy in a quiet factory and a dark basement adds an edge to the chase scenes with large knives and heavy machinery; a massive improvement on the boring apartment of the previous film. While still not being utterly convincing – how realistic can a talking doll actually be? – the film still does well to make you care for the lead and his new protective sister, Kyle. While she doesn’t believe Andy for a large portion of the film, she eventually comes round and sees the truth when actually threatened by Chucky; this is great for older audiences who can finally relate to an older character in the franchise. After all, we hope there won’t be any kids watching this to relate to the lead child character Andy. 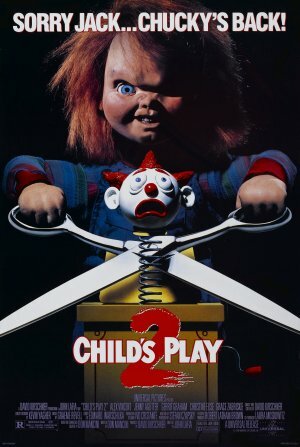 Improving on the previous film, Child's Play 2 uses the same strategy but executes it more effectively. Now with new characters and a scarier Chucky, it certainly delivers on providing a decent continuing story and even lifts the franchise an extra notch. What did you make of the second installation of the Chucky franchise? Is it more of the same or does it do enough different to bring a new compelling film?